His Holiness the Ganden Tripa or Gaden Tripa (དགའ་ལྡན་ཁྲི་པ་, “Holder of the Golden Throne of Ganden”) is the spiritual successor of the King of Dharma Je Tsongkhapa. King of Dharma Je Tsongkhapa (1357–1419) founder of the great Ganden Monastery and the Gelug School is considered the first Ganden Tripa. 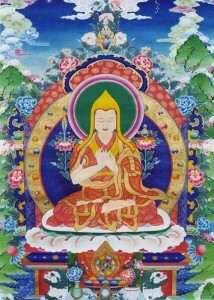 After Je Tsongkhapa passed away, his heart sons Dharma Rinchen Gyaltsab Je (1364–1432) succeeded him as the 2nd Ganden Tripa and Gelek Pelzang Khedrub Je (1385–1438) as the 3rd Ganden Tripa. King of Dharma His Holiness the Ganden Tripa is the official supreme head of the Gelug School of Tibetan Buddhism. From the 17th century, the Gelug school became the most powerful institution ruling Tibet and had remained so until the 1950s. The Gelugpa School is the biggest and the best known among the four schools of Tibetan Buddhism (Gelug, Sakya, Kagyu and Nyingma) and is associated with the Dalai Lama and the Panchen Lama.